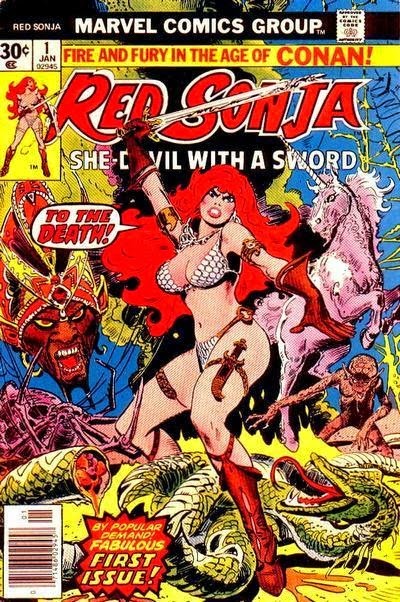 I've decided to start of my spotlight on fantasy comics with the she-devil with a sword, Red Sonja and for a few reasons. For starters and the most important reason being, she's a redhead. Did I not mention that I have a thing for redheads? There is also some interesting stuff going on with the character's creation and ownership which is exactly where we're going to start. Red Sonja was not created by Robert E. Howard. She was however inspired by the character of Red Sonya of Rogatino from Howard's 1934 short story The Shadow of the Vulture. Howard's Sonya was also not associated with Conan or the Hyborian Age, in fact the character was of Polish-Ukrainian blood and was fighting against an Ottoman sultan in the the 16th century set around the Siege of Vienna and the Battle of Mohacs. Another difference is that Howard's Sonya was more of a gunslinger rather than a swordswoman. 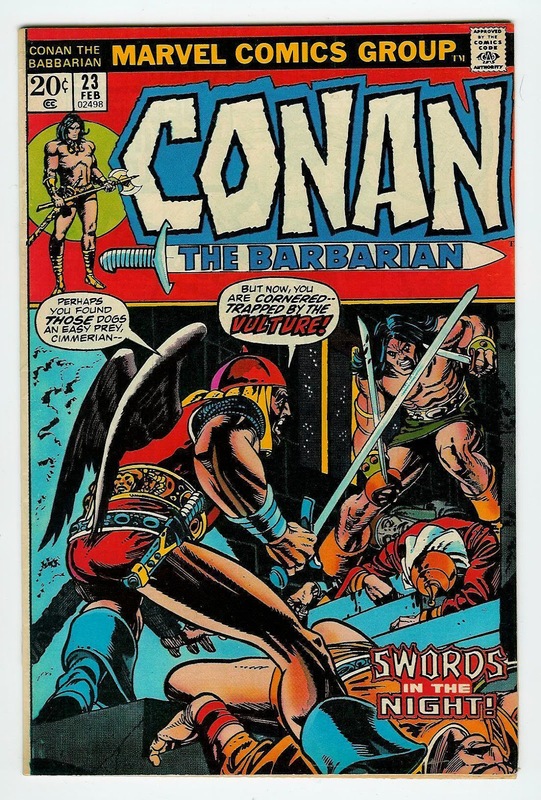 The Red Sonja we're familiar with first appeared in Conan the Barbarian #23 which hit the racks on November 14, 1972. Written by Roy Thomas, drawn by Barry Windsor-Smith, inked by Sal Busecema, Chic Stone and Dan Adkins, and it features a Gil Kane cover. Sonja and Conan team up in a story, Shadow of the Vulture adapted and based on the original. We did not get Sonja's origin story until Kull and the Barbarians #3 on July 8, 1975 which has been updated. It was Roy and Barry that brought Sonja into the Hyborian Age alongside Conan, but Marvel however never owned Sonja. Although I believe Marvel could have claimed a copyright on the Red Sonja character, to my knowledge they didn't even try, fearing a lawsuit from the Howard estate. To me the two characters are clearly different enough that Marvel could have won that case but instead ended up creating a new character for somebody else to claim ownership of. At least, that's how I understand it, I've put hours of research into it but couldn't find too much on that. The subject of some controversy is Sonja's signature scalemail bikini. When first introduced Sonja was dressed a little more appropriately for a warrior. It was artist Esteban Maroto who sent an uncommissioned rendition of Sonja wearing the iconic bikini to Roy Thomas and it has been her armor of choice ever since. There have been instances in which the bikini was replaced with something more practical or covered. Another subject of some concern is Sonja's origin which originally included the character being brutally raped and swearing a vow of chastity. This has remained in place until the newest series written by Gail Simone that offered a retelling in which Sonja was not raped, was not empowered by the goddess and made no vow. Sonja's first series debuted on October 26, 1976 and ran for fifteen issues. Back in these days stores could return their unsold comics by ripping off the title portion of the cover and sending those to the publisher, but in return the stores were expected to destroy those unsold comics, which didn't happen often. This is how I found Sonja, in the pages of one of those ripped cover comics while sitting in a doctor office waiting room featuring the beautiful artwork of Frank Thorne. Right there you could stick a fork in me because I was done. Under Marvel, Sonja had reappeared alongside Conan several times, had further solo series (none of which lasted long) and even fought alongside the webslinger himself, Spider-Man. 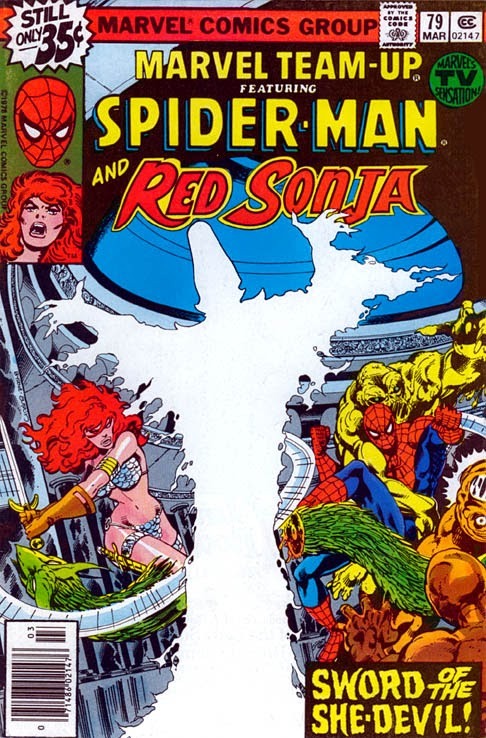 In Marvel Team-Up #79, Peter Parker's girlfriend Mary Jane Watson is possessed by the spirit of Red Sonja teaming up with Spider-Man to stop the sorcerer Kulan Gath. The two team up against Kulan Gath and Venom in a crossover between Dynamite and Marvel. Sounds corny I know, but it's actually not that bad. Marvel's last published Red Sonja work was the 1995 Scavenger Hunt one-shot. Dynamite began publishing a new volume of Red Sonja in 2005, and added Queen Sonja in 2009 along with a number of one-shots and mini-series. The newest ongoing in a reboot of the character written by the amazing Gail Simone of Batgirl and Birds of Prey fame. Dynamite's run with Sonja has been hit or miss for me. There were just times the writing fell flat and their seemed to be some continuity issues as well. Now that Gail is at the helm there's been a great deal of improvement. Another mini-series that seems out of place is the Red Sonja and Witchblade crossover from 2012 however it was done pretty well and was quite enjoyable. 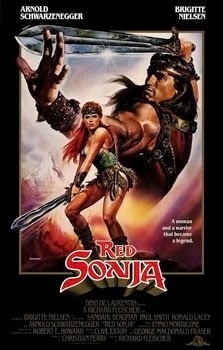 The 1985 Red Sonja film is what it is. Not great, filled with some less than stellar acting and fight scenes but enjoyable and worth a watch. There was remake planned but it didn't go anywhere. Sonja is who I based the majority of my characters on in my Dungeons & Dragons days. Sure I could have gone with the archetypes based on Conan, Aragorn, Legalos and others, but there was something in reading those Sonja comics all those years ago that told me that women can be the hero just well as any man, in many cases they make stronger heroes. The next I'll be tackling Travis Morgan also known as The Warlord from DC Comics. I agree Red Sonya belongs in the great hero's hall of fame. She deserves a rightful place next to the great heroines such as Wonder Woman, Batgirl, Supergirl, and a slew of others. I remember as a kid loving every book I ever saw her in. Dynamic Comics were also hit or miss with, me as well. I am familiar with Gail's work in Batgirl. So I will have to check her take on Sonya out.